We're a bit closer to Christmas and my list isn't any shorter than it was a few days ago when I shared six gift ideas I think most women would love to find wrapped up with their name on it. But now it's time to think about the guys and I still have a few things to get for my husband. While these ideas from last year are still solid in 2015, here are a few new ones if you're still shopping too. This zip-up hoodie from Tommy John (1) looks so warm and stylish, I'd love for Woody to wear this from the gym to brunch on a Sunday morning. Speaking of Sunday mornings.... while Denver is known for great beer, we also have really amazing coffee from local roasters including Corvis Coffee Roasters; our current favorite is their Santa Barbara single origin (2) from El Salvador. 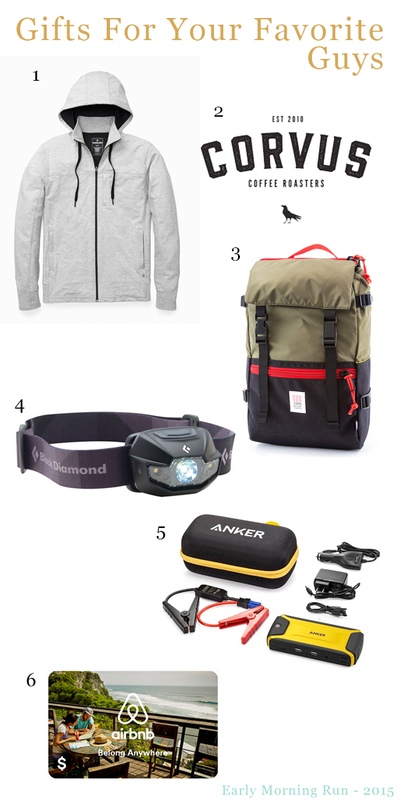 Another great Colorado brand is TOPO Designs which offers a line of Colorado-made gear including this awesomely useful and great-looking Rover Pack (3) as well as a number of lower-priced accessories. Woody has borrowed my headlamp enough times I think it's time to get him his very own Black Diamond spot headlamp (4). One thing he did get himself recently was a compact car jump starter and portable charger (5) - it seems like a tool MacGyver would have loved because such small thing can do so much. This last one is my favorite idea - an airbnb gift card to inspire the guys in your life to turn off Netflix and go on a real life adventure in 2016!